Back in 1976 the Champagne house of GH Mumm sent winemaker Guy Devaux to the United States of America. His mission was to find the best place in the country for making champagne style sparkling wines. 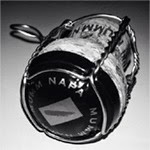 He decided on Napa Valley and in 1983 he released the first wines of Domain Mumm, later to be named Mumm Napa in 1990. Today Mumm Napa is considered one of the premier sparkling wine makers in the USA. Their vineyards are Napa Green certified. 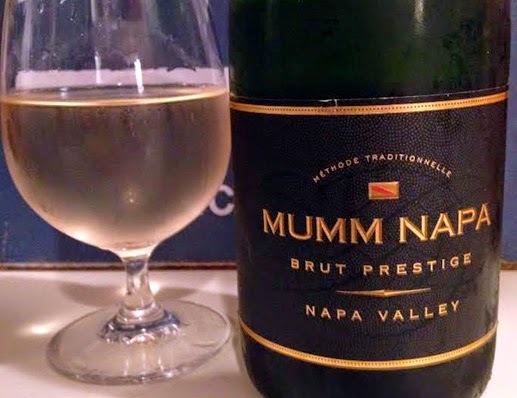 The Brut Prestige is Mumm Napa's flagship wine. It's 45% Chardonnay, 45% Pinot Noir and 10% Pinot Gris / Pinot Meunier. Initially fermented in stainless steel tanks, a portion of the wine is aged in French oak for the final blend. Second fermentation for carbonation is done with the traditional method, inside each bottle, and it sees 18 months of aging on the lees. After degorgement and dosage it rests for three months in the bottle before release. 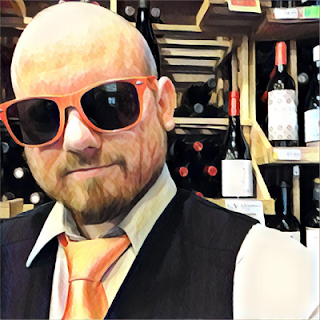 If none of that made sense, you can read A Bubbly Biography, The Story of Sparkling Wine - Part 1: France and Spain to learn about what all those weird words mean. With that out of the way... I'm thirsty for bubbles! Let's drink! So I was able to open the bottle with the perfect hiss and not even a hint of a pop. Hey, I at least to TRY to do things right. Just because I'm listening to Alice in Chains right now instead of Mozart while drinking sparkling wine doesn't mean I'm a complete barbarian. So I pour it into my glass and take a few pretty pictures for your visualization enjoyment. The wine is pale with a slight initial head that quickly dissolves. After that the bubbles are almost imaginary. Just a few here and there. The very first thing I notice on the first sip is that it's sweeter than I thought it would be. Don't get me wrong, I'm not saying it's sweet-sweet, but the sugar from the dosage is far more detectable than I expected. Tart green apple and raspberry greet the palate up front, the midpalate fluffs out into pineapple and cream, and the finish reverts to raspberry but with a slight touch of hot cinnamon. I'm actually disappointed. I was excited for tonight and was left frustrated. Seriously, the whole time tasting and writing I was thinking about how disappointed I was. So I went looking for other reviews and they were all glowing and I thought.... "is something wrong with me?" No. Nothing's (arguably) wrong with me. This is an alright sparkling wine and I wouldn't complain at all if it was poured in front of me. But my expectations were set pretty high based on its reputation. Honestly I'm not sure what to say other than it's serviceable and a smart pick up in bulk liquor stores with limited options. But if you're somewhere that knows their sparkling wine than they can do better with your dollar. That all being said, this is only one product by Mumm Napa. I've had other wines by them that I've liked. Hell, I adore their Brut Rosé. Get that one instead of the Brut Prestige. Rating: 2/5 = Not Impressive.